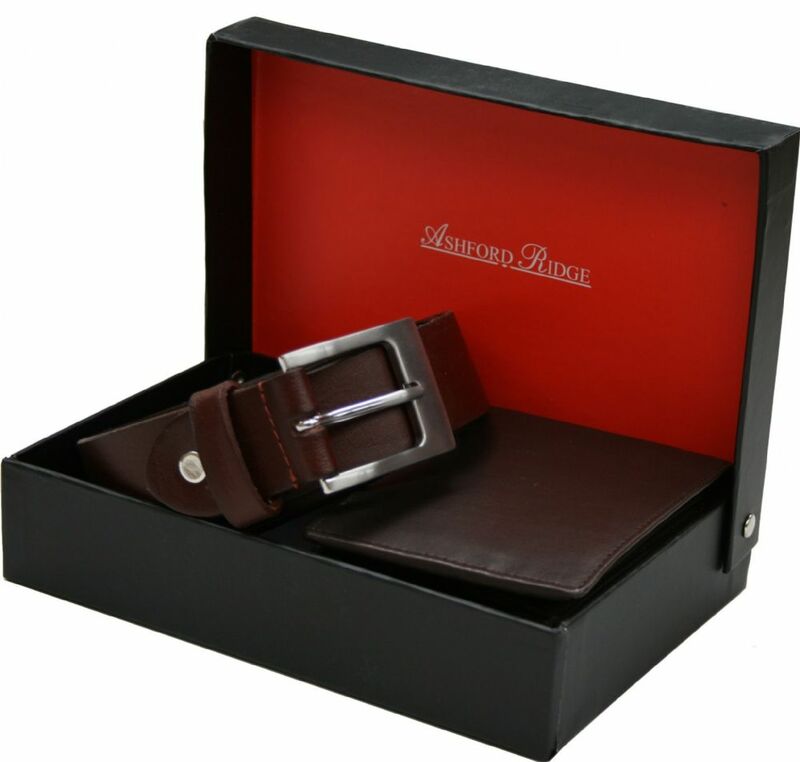 Medium 32" - 36" Large 36" - 40" XL 40" - 44" XXL 44" - 48"
This Ashford Ridge™ Premium leather belt and wallet gift set comes in a matching Ashford Ridge™ gift box. It consists of 2 of our finest full vegetable tan milled leather products and is available in either black or brown (black belt with black wallet or brown belt with brown wallet). Mens Ashford Ridge™ Premium fine milled leather wallet with credit card pockets, 2 window pockets for ID closed by a button loop. It also has 2 notes sections, a coin compartment with press stud fastening and a centre zipper for keeping important cards/receipts extra secure. It is made of the finest milled cow leather which is durable and strong while feeling soft to the touch and will get better as it ages. Wallet Measurements: 11.5cm x 9cmx 1.5cm. Made in England by us, this mens Ashford Ridge™ Premium 33mm classic full grain hide leather belt is made to last. It is a 3.5mm thick full hide leather strap which is incredibly strong and will get better with age as the leather slowly softens over the years. It has a screw fitted stitched buckle fastening with a chrome effect silver colour buckle. When put together you have this stunning full leather Ashford Ridge™ Premium belt. It’s important to take the measurement with your trousers on and where the belt is intended to be worn i.e. the measurement may be nearer your hip measurement than your waist. If you are unsure of which size to buy we would always suggest ordering a slightly larger belt rather than one that might just fit as you can always add an extra hole but you can’t extend the length of the belt.